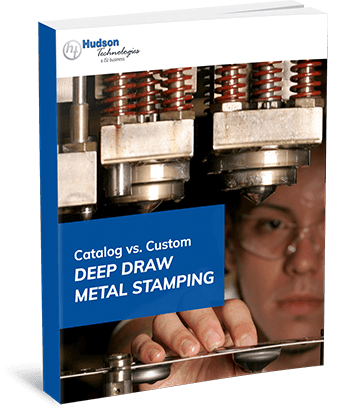 The team at Hudson Technologies is proud to specialize in custom metal diaphragms, which we create using advanced tool designs and sophisticated power press technology. Put simply, metal diaphragms are thin, circular plates that elastically deform when subjected to axial loading or pressure. These mechanical seals are typically manufactured by forming a thin metal sheet into a ripple shape. Depending on their intended use, metal diaphragms can be corrugated, domed, or flat; corrugated types are the most versatile and widely used. Flat diaphragms can usually be mass produced, but corrugated diaphragms require a proprietary tool for the manufacturing process. They have greater deformability and a linear characteristic curve. Metal diaphragms are available in a variety of materials and sizes, and can be used in many different applications. Hudson offers metal diaphragms made of Inconel®, Haynes® 242®, Hastelloy®, titanium, Monel®, and 17-7 PH stainless steel. The ideal profile shape will depend on specific pressure, cycle life, and deflection requirements. Hudson offers a wide selection of standard-catalog corrugated diaphragms, ranging in size from 1” to 3” in diameter. There are a number of advantages to using corrugated metal diaphragms. First, they achieve a larger linear range with improved mechanical sensitivity. Next, the corrugations can greatly improve pressure regulation and deflection. And finally, corrugated diaphragms provide accurate spring rates and long cycle life. Corrugated diaphragms allow for higher deflection than flat diaphragms, at the same working pressure. Studies have also shown that the sensitivity of corrugated diaphragms can be easily controlled by changing parameters such as the thickness of sheet, the depth of corrugation, and the pitch of corrugation. Corrugated metal diaphragms are ideal for high-pressure applications and high-temperature applications, such as mechanical seals, edge-welded bellows, pressure transducers, pneumatic modular instruments, electronic control instruments, and medical devices. Hudson Technologies has been an industry-leading metal diaphragm designer and manufacturer since our founding in 1940. With a reputation for high precision and unparalleled quality, we provide ultimate peace of mind to our customers through our stringent quality control protocol, AS9100D certification, and 13485:2003 and 14001:2004 compliance. From one-piece orders to high-volume production, our team is with you every step of the way. To learn more about Hudson Technologies’ manufacturing practices and custom metal diaphragm capabilities, reach out to our experts today. We’re on hand to answer any questions you may have, and will guide you through every step of the process to ensure you receive a solution that meets your exact needs.